Great book. Must read. Something to highlight on almost every page. The first few chapters seemed a big slow moving but from chapter 7 it really took off and just got better and better. Particularly loved the way that Perman shows how the gospel makes a difference – that the goal of having everything under control is an unattainable myth and cannot be the source of our peace of mind – only justification through faith gives that – but also how the Christian life is an exciting adventure of love, serving others with excellence and creativity. The book basically works like a funnel moving from the big mission all the way through to actually getting (the best) things done. The first half of the book is immensely valuable for anyone – how to line everything up under a single-minded focus on Christ and his glory and loving others. But particularly the second half is aimed at those involved in “knowledge work” – i.e. largely desk/meeting based jobs dealing with a lot of emails, juggling projects and with quite a lot of freedom to decide what they are going to do each day. Very helpful for managers, pastors and the self-employed but with less that’s applicable (particularly in the second half of the book) to the street sweeper or stay-at-home mum. (Others have noticed this and Matt has acknowledged the weakness and his wife Heidi has written on how WBN applies to homemakers). I love the idea of getting our life mission clear from the Word. I wonder whether Matt might have slightly overemphasised Matthew 5:16 – doing good works that our Father is glorified – above other ways in which we glorify God – e.g. preaching the gospel, enjoying Christ, enduring suffering because of Christ. 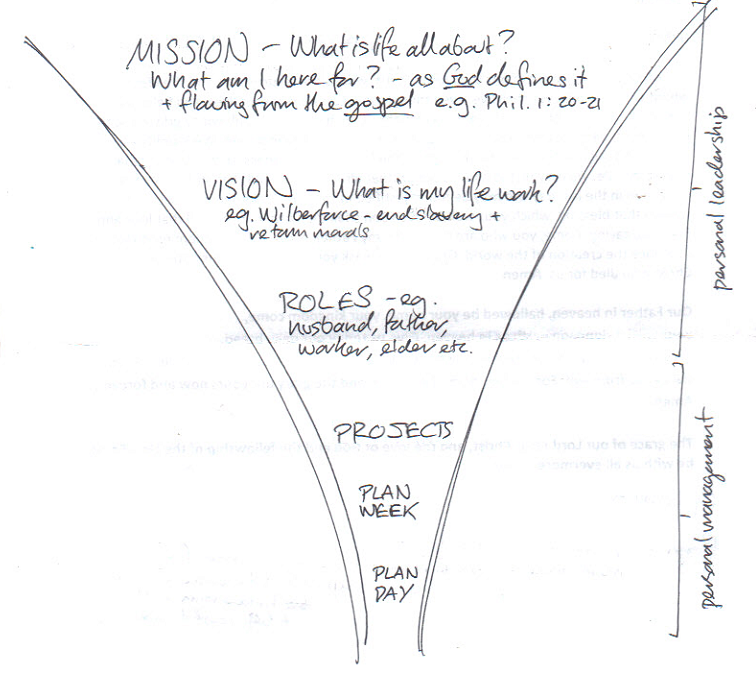 I appreciated the separation of life mission from life vision/work – the former being something that all Christians must do and we can do in any circumstances (e.g. thanking God, knowing Christ more and more, loving others) and the second being something that I feel I have been particularly given to do during my lifetime which I might not be able to accomplish at all times in my life (e.g. Wilberforce’s work of ending the slave trade and reforming manners). My quibbles are: a) I would put the great commission (Matt. 28:18-20 cf. 1 Pet. 2:9) in the mission category not the life vision/work category; and b) It would have been good to include in the discussion of life work such things as being a husband/wife and/or father/mother (Eph. 5-6). Occasionally, as with his good friend John Piper he perhaps leans a little too heavily on Jonathan Edwards who, though almost always brilliant, sometimes leads us one or two steps from Scripture in a slightly speculative direction. I’m personally not so keen on language of “principles” (I think love is better understood as a command to obey) or language of “call”/”vocation” applied to life work or jobs (I think calling language is best reserved for the level of the life mission of all believers). Where Perman says that our vocations are the key way that the gospel spreads through the world (p. 320) I’m not sure quite what he’s saying or where he gets that from – I need more convincing on that point. Surely there needs to be explicit proclamation? But these quibbles are hugely outweighed by how much I got from this book. Perhaps the best thing I can say about it is that it achieved for me what no other time management book has done – I actually put it into practice. I sat down one morning and worked out what I’m here for, listed my roles, make a plan for my week and started planning my days (usually happens). It has actually changed what I do. For the better. And for that, Matt, thank you very very much. 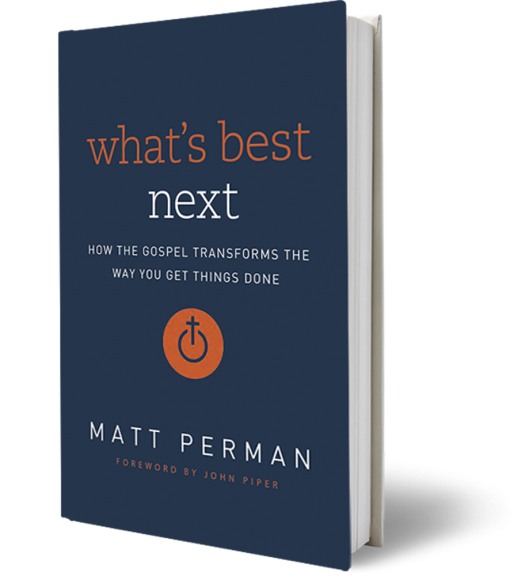 Check out Matt Perman’s blog What’s Best Next, read the ‘Foundational Posts’ and start following for helpful insights on Gospel-Driven Productivity. Tags: Matt Perman, productivity. Bookmark the permalink.